We’ve all heard of card skimmers, nefarious devices that steal the identity of credit and debit cards, attached to ATMs and other machines in which unsuspecting consumers use them. Often they have relied on physical extraction of data from the card itself, such as by inserting a magnetic stripe reader in a fake ATM fascia, or by using a hidden camera to catch a picture of both card and user PIN entry. The folks at Sparkfun write about an approach they received from a law enforcement agency bearing a selection of card skimmer devices that had been installed in gasoline pumps. 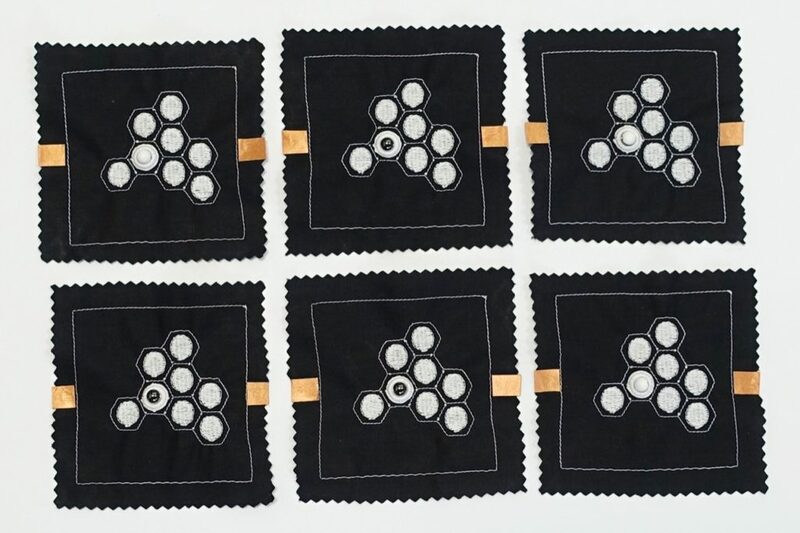 These didn’t rely on interception of the card itself, instead they sat as a man-in-the-middle attack in the serial line between the card reader unit and the pump electronics. Let that sink in for a minute: a serial line that is readily accessible to anyone with the pump manufacturer’s standard key, carries card data in an unencrypted form. The owner of the skimming device is the criminal, but the company leaving such a wide-open vulnerability should really be joining them in having to answer to authorities. The device itself is quite simple and well-executed, though it appears that attachment of wires and connectors is a job left to the crook. Some boards boast excellent soldering, while others have joints that are, well, simply criminal. On the board is a PIC microcontroller, a serial Flash chip, and a commodity Bluetooth module. This last component provides the means for the miscreant to harvest their ill-gotten gains, and incidentally a handy means by which compromised pumps can be identified. 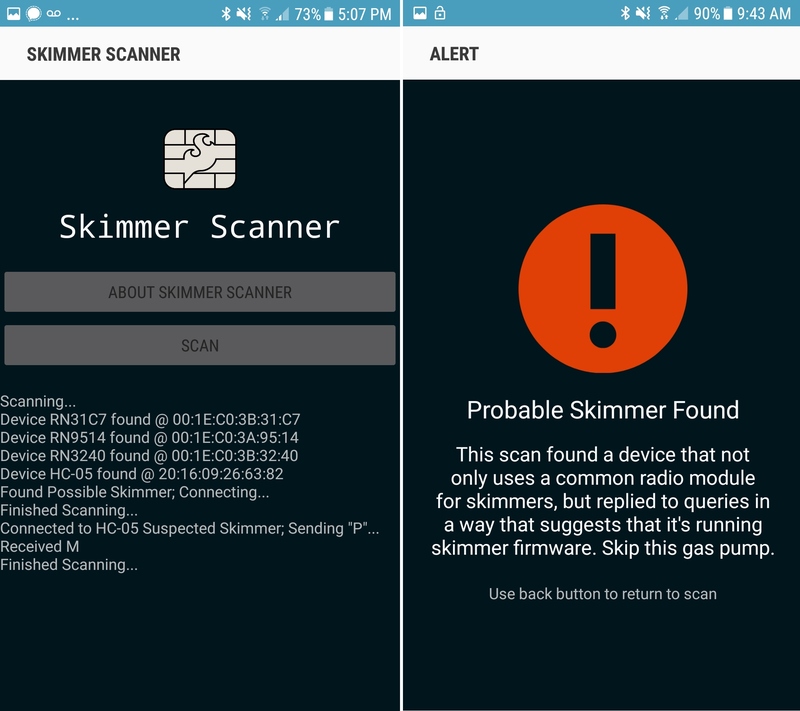 The Sparkfun people have provided an Android app that interrogates any modules it encounters, and warns of any that return the signature of a skimmer. It is sad to say that some level of crime is an inevitable feature of the human condition, and therefore it should not be an unreasonable expectation that any entity with which we trust our sensitive data such as a credit card number should take reasonable steps to ensure its security. If a bank transported customer cash through the streets as bundles of $10 bills in open handcarts it is likely that they would get into trouble very quickly, so that the pump manufacturers send card information in the clear over such a readily accessible medium should be a scandal of similar magnitude. That financial institutions prefer to cover up the problem and shift the loss onto the gas stations rather than mandate better device security from the pump manufacturers speaks volumes about their misplaced priorities. If this topic interests you, we’ve shown you a teardown of a more traditional skimmer in the past. Thanks [CYK] for the tip. The other day I saw a plastic part that was so beautiful that I had to look twice to realize it hadn’t been cast — and no, it didn’t come out of a Stratysys or anything, just a 3D printer that probably cost $1,500. It struck me that someone who had paid an artisan to make a mold and cast that part might end up spending the same amount as that 3D printer. It also struck me that the little guys are starting to catch up with the big guys. Sometimes it’s just a matter of getting a hold of the equipment. If you need a Bridgeport mill for your project, and you don’t have one, you have to pay for someone else to make the thing — no matter how simple. You’re paying for the operator’s education and expertise, as well as helping pay for the maintenance and support of the hardware and the shop it’s housed in. I once worked in a packaging shop, and around 2004 we got in a prototype to use in developing the product box. This prototype was 3D printed and I was told it cost $12,000 to make. For the era it was mind blowing. The part itself was simplistic and few folks on Thingiverse circa 2017 would be impressed; the print quality was roughly on par with a Makerbot Cupcake. But because the company didn’t have a 3D printer, they had to pay someone who owned one a ton of cash to make the thing they wanted. But access to high end tools has never been easier. Hackerspaces and tool libraries alone have revolutionized what it means to have access to those machines. There are four or five Bridgeports (or similar vertical mills) at my hackerspace and I believe they were all donated. For the cost of membership, plus the time to get trained in and checked out, you can mill that part for cheap. Repeat with above-average 3D printers, CNC mills, vinyl cutters, lasers. The space’s South Bend lathe (pictured) is another example of the stuff most people don’t have in their basement shops. This group ownership model may not necessarily grant you the same gear as the pros, but sometimes it’s pretty close. Cronk — functionally an oversized USB charging hub with a lot of bells and whistles — is remotely controlled by a modified Wii Nunchuck very controller similar to the one [bithead942] used to control his R2-D2. With the help of an Adafruit Audio FX Mini, an Adafruit Class D 20W amp, and two four-inch speakers, the droid can rattle off some sound effects as it blows off some steam(really, an inverted CO2 duster). An Arduino Mega acts as Cronk’s brain while its body is sculpted from cast-able urethane foam for its light weight and rigidity. It also houses a FPV camera, mic, and DVR so it can be operated effectively from afar.